Canyon Lake, TX Violin Lessons Near Me | Fun Classes. Top Tutors. Check out some of our most popular teachers near Canyon Lake, TX including San Antonio, Cibolo, Schertz, Helotes and Converse. Instructions are based on custom curriculum for every student. The curriculum is based on student's desires and abilities and compiled from multiple sources. Please let me know if you ever have any questions about equipment and accessories needed! I teach violin from beginning level to upper advanced. My students go on to perform/audition in solo/ensemble competition, All-Region Orchestra, and play in either a youth orchestra or school orchestra. My adult students pick up the instrument for its bright airy tones and spirited versatility. Experienced Violin teacher of 8 years available for eager students of all experience levels and ages! I structure my lessons so students learn what they want to learn, while also building a strong foundation of music knowledge. I specialize in classical and Celtic, typically use Suzuki Method and Essential Elements books. I evolve with each student and create a fun a positive environment in which to learn and I strive to help you meet your goals! I plan and offer yearly professional student shows and concerts to give each student a practical application to their studies. I have been teaching violin/fiddle for 9 years. My students will learn how to solo, as well as play along with other instruments. I use a variety of materials to suit the student's needs and teach a variety of music skills such as accompaniment, improvisation, and theory at my lessons. I teach to any age and experience level. I look forward to meeting and working with you! When it comes to violin I use both book and audio. I want to help my students learn to not only read the music but to also hear and feel it. I have been teaching this way for the last few years and found that my students have a deeper understanding of the music by learning the see with their ears. Each student is tasked with coming up with goals that they want to reach, goals their parents would like for them to reach and from there a personalized path for learning is created and followed. I picked up music when I was very young and have never looked back. I started with the piano and then moved on to the violin, of which I competed regularly in up until high school. In high school I switched the viola and found it to me even more amazing. During high school I competed again in music between schools, the San Diego Youth Orchestra. I currently work with several students with special needs such as Autism and other Neurological delays. My son is Autistic and music was a great way for him to express himself. I found that the other children I work with on the spectrum have more abilities to express themselves through music then with words. I also work with students that are not yet comfortable with themselves and getting them to breath and enjoy the music helps bring them out of their shells. ut with another music instructor every chance we get. Music is a great relief and enjoyment that I want to share with as many people as I can. I am currently in college getting my Bachelors degree in History with a minor in Music. She worked with my daughter well in spite on some technical difficulties on the website. April was really good. My daughter liked her and she is all excited. Christine believes that music is a basic and essential human activity, and the joyful and fulfilling pursuit of creating it ought to be offered to all individuals. She sympathizes with the Suzuki perspective that encourages teaching toddlers and knows that Every Child Can, regardless of circumstance. Christine also supports adults who wish to begin or restart their musical journeys. She derives great joy from working with students coming from a variety of different circumstances and helping all of them to experience the bliss of making beautiful music in an ensemble and individually. Since starting her musical journey twelve years ago, Christine Bryant has rarely put down the violin. This led her to the University of South Carolina where she graduated with a Bachelors of Music in Music Education in 2016. She studied under violinist Neil Casey for eight years. The University of South Carolina provided her with a myriad of teaching experiences. She taught at String Project for four years, teaching both private lessons and string classes. After earning her degree, Christine directed Fairfield Middle and Fairfield High School’s orchestra program. In the summer of 2015, Christine received her Violin Suzuki Certification at the University of East Carolina. These diverse pedagogical influences have left her well-versed in both the Galamian and Suzuki methods. rently works with Duke University’s Continuing Education Department and is earning her MAT in Elementary Education from North Carolina State University. She is excited to begin teaching lessons in the triangle. During her time away from work, Christine enjoys playing jazz and bluegrass with her husband, Carsten. Though Christine is new to the Durham area, you may see her perform at Nash Street in Hillsborough or at various churches around the area. She also performs with the Chapel Hill Philharmonia. Here at NB Violin Studio we believe that great foundations lead to great futures. That’s why we’ve created a comprehensive violin lesson curriculum that focuses on the fundamentals of music, preparing students for a lifetime of musical understanding, enjoyment, and achievement. 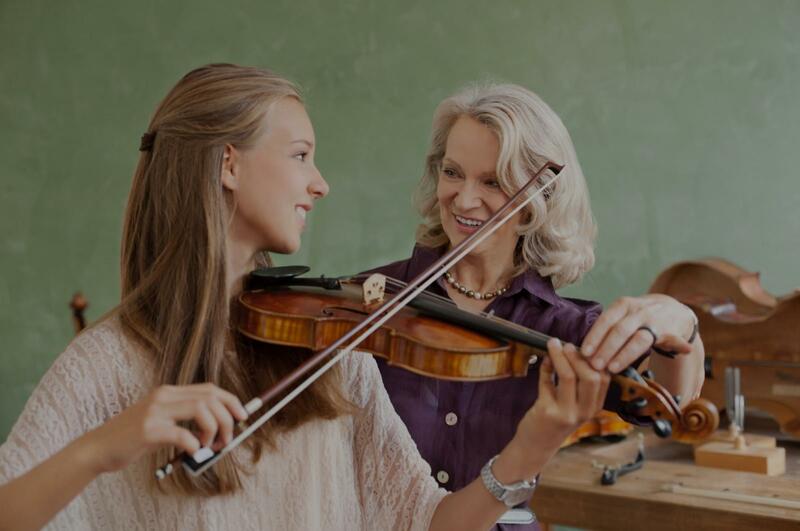 Our instructors specialize in teaching violin lessons utilizing the Suzuki Method alongside other supplemental materials tailored to the students’ learning needs. With nearly 20 years of violin experience, lesson instructor Hannah has developed a unique perspective and skill set in this field. She began violin lessons at the age of 4 learning the Suzuki Method and has since then continued to be passionately involved with classical repertoire, music theory, chamber groups, musicals, orchestra rehearsals, and lesson instruction. She has held numerous principal positions with the Everett and Cascade Youth Symphonies- playing in coveted venues such as Benaroya Hall in Seattle, Wa. Since moving to New Braunfels, Tx, she became a member of the Starlight Symphony Orchestra and enjoys playing seasonal community concerts and local charity events. In addition, she holds a BS in Biology from Baylor and a MBA from West Texas A&M. Can't find a teacher in Canyon Lake, TX? "Thorough and clear instruction. Excellent teacher! Five Stars!" San Antonio, TX teacher: Clare H.
"If you're someone who is new to music and looking for the right teacher, give Clare a call. th Clare for eight months. I am an adult violin student and before I took lessons from Clare I had virtually zero previous musical training. Clare was the perfect teacher for me. She kept me interested and motivated to learn. Her lessons were well thought-out, well taught and, just as importantly, they were just plain fun. Because of Clare I feel like I have an excellent foundation from which to continue my learning. If I wasn't moving away because of a new job I would definitely still be taking lessons from her. As an adult, I was kind of nervous to start learning a musical instrument, especially one as tricky as the violin. Clare helped me immensely. She's a wonderful teacher." h her students, guiding them in a fun and exciting way to reach further advancement in their musical endeavors. It is extremely refreshing to associate with someone of Clare's caliber, and knowledge, and I would highly recommend her to anyone seeking to begin or continue development of their musical potential. J. Watson, Windcrest, TX"